The Breeders Assistant is proud to provide this comprehensive instructional DVD. 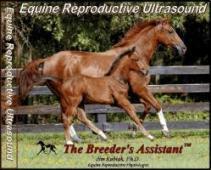 This 2 hour DVD provides mare owners the practical & technical skills necessary to safely ultrasound their own mares. It includes over 45 minutes of actual ultrasound scans and labeled ultrasound images to assist you with identification & interpretation of the images you are viewing on the ultrasound screen.